Three-dimensional printing is the production or “printing” of actual objects, such as toys or parts for devices, by using a machine that traces out layers of melted plastic in specific shapes until it builds up a piece exactly according to the size and dimensions specified in a computer-aided drawing produced by a designer. Increasingly, with user-friendly computer programs and 3-D printers, the designer can be anybody. Eventually, almost any object or parts for objects, may become 3-D printable, including body implants, in a range of materials, including medals. Engineers and engineering students at the University of Virginia are using sophisticated 3-D printing technology to make an array of objects, including a plastic airplane for a Department of the Army project. 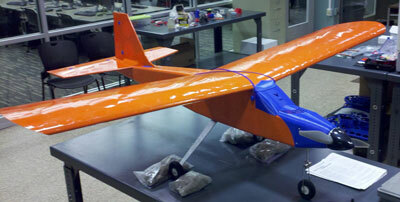 An unmanned aerial vehicle built at the University of Virginia entirely from parts from a 3-D printer. David Sheffler, a U.Va. professor of mechanical and aerospace engineering in the School of Engineering and Applied Science and 20-year veteran of the aerospace industry, teaches 3-D printing to engineering students and can discuss the future of 3-D printing in industry and society. Sheffler: Many have already started talking about the typical household having a 3-D printer in the next five to 10 years. Products would be purchased online in the form of a downloaded file that would be printed out in the home. It might be possible eventually to print your own shoes after scanning your feet, or maybe printing your clothes. Some believe this technology stands about where personal computers were in the mid-1980s in terms of maturity. Most of the uses probably have not yet been conceived. Q: What is U.Va. doing in 3-D printing?